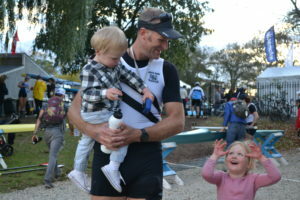 After hearing cheers from the crowd all the way up the race course during Saturday’s Men’s Championship Singles race, Mahé Drysdale docked at the Cambridge Boat Club and was greeted with cheers and smiles from his two biggest fans–his kids, Brontë and Boston. Drysdale may have finished fifth in yesterday’s race, but to Bronte and Boston, their dad is always a winner. Drysdale has been rowing in the Head of the Charles for more than a decade and has continually come back because of his love for the sport, and for Boston. This year was the first time his kids made the trip to watch him compete. This is a momentous family occasion, for it marks his son, Boston’s, first visit to the city he is named after. Although Drysdale said the kids originally had some trouble getting used to the time zone, on the day of the race they could be seen running around the boat club itching to spend some quality time with their dad. Always a favorite to win whenever he takes to the water, the reigning Olympic gold medalist was philosophical about his fifth-place finish. Drysdale last rowed singles in July—he rowed in the New Zealand quad at the World Championships—took four weeks off after the worlds, and although he said he was happy with his performance on Saturday, he felt a bit rusty getting back into the boat. He added that being a parent gives him a new appreciation for rowing and helps him recognize the privilege he has to have a job doing something that he loves. That being said, he understands that his time as an elite competitive rower is nearing its end. Drysdale is determined to make the sole singles spot on the New Zealand team for the Tokyo Olympics to defend his gold medal. He knows winning Olympic gold medal at the age of 42 is almost unheard of. But he feels no looming pressure on him to go out with a bang. This year’s Head of the Charles marks the beginning of the last leg of Drysdale’s international rowing career. While he will probably never hang up his oars for good, he has built a legacy granting career that will forever keep his rowing spirit alive. For him, this means continuing to push the limits of his body to new extremes. “Rowing is a sport that just keeps giving back and you know I just love the experience and I will always love trying to push myself to a place that no one has really been before,” said Drysdale.